Ready for another cruise down Barbary Lane? Streaming behemoth Netflix has just dropped the first images to its much-anticipated revival of Tales of the City. 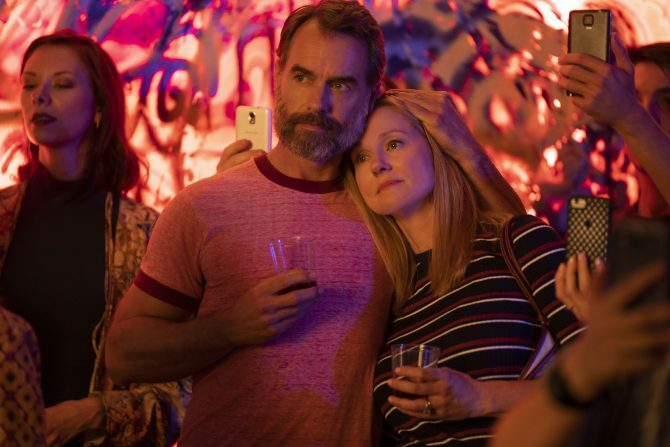 Based on the writings of gay San Francisco author Armistead Maupin, Tales of the City follows the lives of a group of friends who live in the same San Francisco apartment complex, as well as the eccentric other San Franciscans that move in and out of their lives. The series gained a massive following thanks to its diverse portrayal of straight and queer characters and became a much praised–and controversial–PBS miniseries back in 1993. Two sequels followed on Showtime. Now, Netflix has picked up the torch, reuniting original cast members Laura Linney, Olympia Dukakis and Barbara Garrick to catch up with their characters more than 20 years on. Naturally, plot points remain a closely-guarded secret, though Netflix has announced that the new cast will include Ellen Page, Charlie Barnett, Murray Bartlet, Daniela Vega and Molly Ringwald. We also know that much of the plot will involve a reunion between MaryAnn (played again by Linney), her ex-husband Brian (Gross) and their daughter Shawna (Page) along with Maupin’s usual tapestry of San Francisco residents. Tales of the City will arrive on Netflix sometime this summer. THE ORIGINAL IS GREAT SO I AM EXCITED!!! I saw the main picture and thought they were announcing a third season of Looking, got so excited!! But, I still am excited by this too. Seems like a great cast. And Olympia is back?!? Love! Now let’s just hope they don’t louse it the hell up. When Armistead Maupin announced this to us at his personal appearances last year he made it clear that he was fully involved, so whatever they deliver has his blessing. Who writes this stuff? “…the plotlines are a closely guarded secret…” Seriously? Try reading the book it’s based on. Doesn’t anyone read anymore? I don’t know who you people hire as factcheckers but they need to be fired, the sequel to the series was on Showtime, NOT HBO. We’re living in a world of allegedly acceptable ‘alternative facts’. Looks like they have skipped over several of the books 🙁 Reading the books it told the evolution of Maryanne and how she changed, ending up choosing her career over her family and leaving San Francisco. This picks up from the book where she returns to Barbary Lane and tries to re-establish herself and regain her family. I would have liked to see the rest of the books turned into shows before this one, as this means that they have skipped over several important storylines involving the other characters. I wish they would get more gay content in general, I’ve seen all the gay stuff they have but they put new Queer/gay films on so rarely and often they’re not very good. Wish they would get Boy Erased and Call me by My Name.